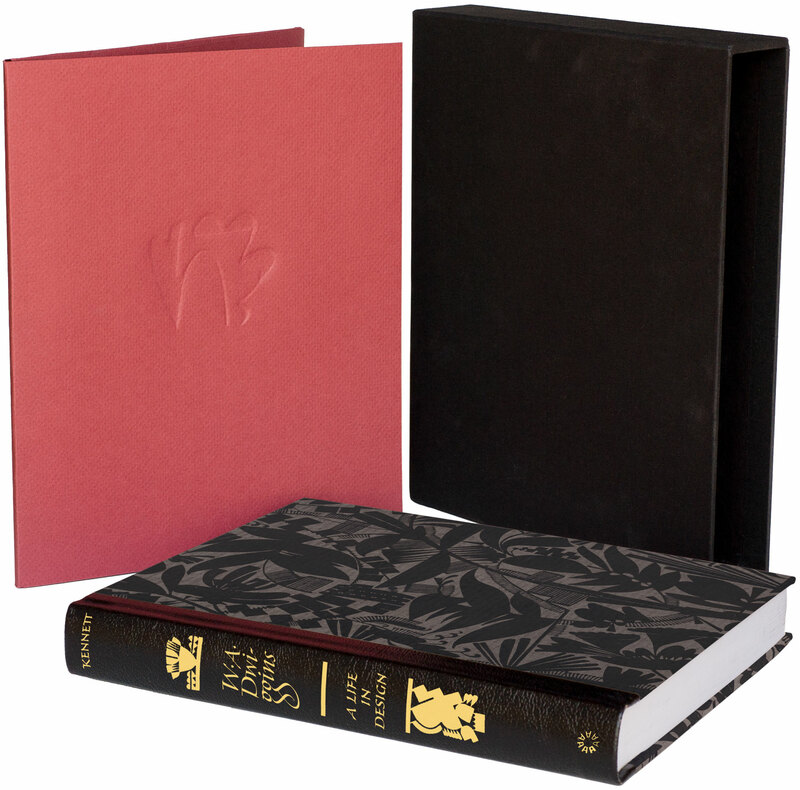 The deluxe edition of W. A. Dwiggins: A Life in Design with letterpress portfolio, slipcase, and spine foil-stamped in gold. Bruce Kennett’s biography of W. A. Dwiggins is nearly ready to go to press. A few lucky backers of the project are set to receive the deluxe edition of the book, bound with a leather spine that features gold foil-stamped lettering by master calligrapher, Richard Lipton. This week we talked to Richard about penning the proper spine for Letterform Archive’s first publication. What’s your relationship to Dwiggins’s work? Richard Lipton: Like so many graphic designers, calligraphers, and type designers, I had something of a love affair with his multifaceted work. He was a consummate craftsman and there is much to admire in so many aspects surrounding his many interests, accomplishments, and sense of humor. I came to his work first as a budding calligrapher. 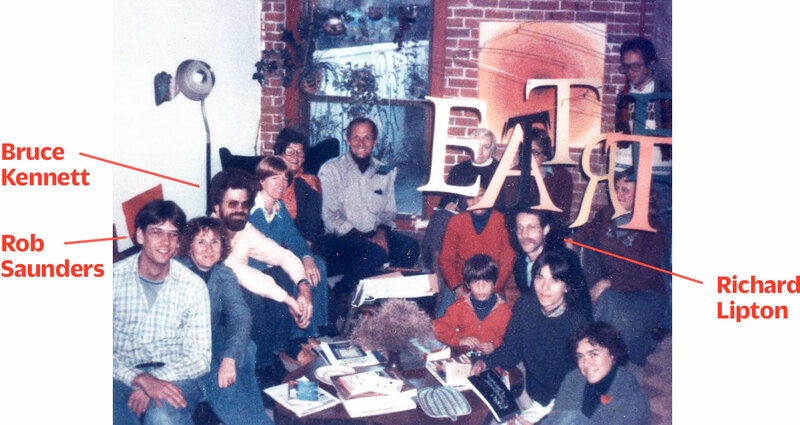 I had the opportunity to visit his Hingham studio along with Ed Karr and Jackie Sakwa in the early 1980s and was given a personal guided tour by Dorothy Abbe. I was just fascinated by everything I saw there and heard the admiration in Dorothy’s voice as she described his talent and dedication to everything he touched. There is a warmth and human touch present in all of his work that spoke clearly to the time in which he lived. Richard Lipton at work in his home studio. 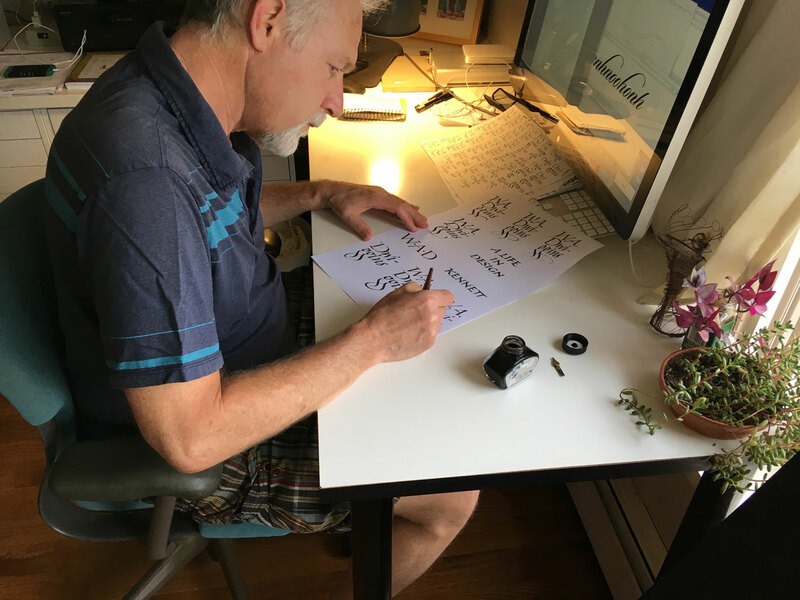 On the screen is a font editor (Lipton is known for his many calligraphic script typefaces such as Bickham Script and Sloop), and on the table is his trusty Speedball pen and ink. Dwiggins explored many different lettering styles over his career. What sort of calligraphy seemed appropriate for the spine? RL: Well this was a bit of a challenge as I had to decide at the outset how much of Dwiggins’s lettering style would directly influence my approach. After many dubious initial sketches trying to follow his calligraphic style(s), I took a break and had a bit of an epiphany. WAD’s friendly warm smile was hovering nearby and gently nudged me to just do my own thing and he would be happy. So I let the pen just find its own way through the letters. Have you used this style in other work, or is it a new approach for you? RL: It wasn’t really a new approach. I tend to work best from what I already know, so the style I ended up using was a variation of a core italic for “W. A. Dwiggins”. The details are the fun part, the joins/ligatures that arise naturally for certain letter combinations. The challenge in a small piece of lettering, like on a spine or in a logo, is to find the right balance and harmony in all of the design spaces that the lettering creates. 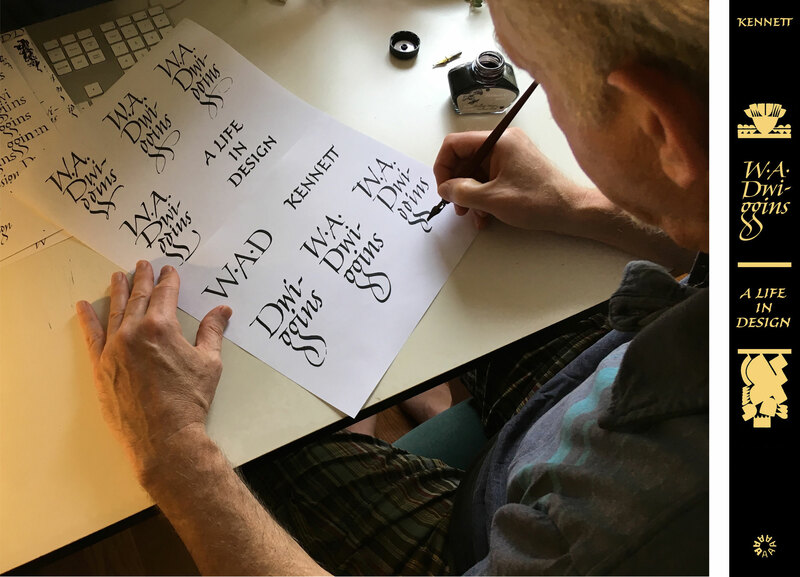 The spines of both the deluxe and standard editions of W. A. Dwiggins: A Life in Design will feature Richard Lipton’s calligraphy and Dwiggins’s ornaments. What kind of pen did you use? RL: My trusty old standby, a Speedball C-2. RL: Bruce suggested that I honor Dwiggins’s preference for the spines of his book designs by keeping the lettering upright, so that titles and authors can be easily read by not having to tilt your head. This of course necessitates having to break up words to accommodate the narrow design space in a spine. The particular challenge I had in lettering Dwiggins was the fact that I had to deal with four dots and one hyphen in such a tight space. These small but possibly distracting elements finally found their rightful places. Left: Dwiggins’s binding for In A Word by Margaret S. Ernst, Knopf, 1939. 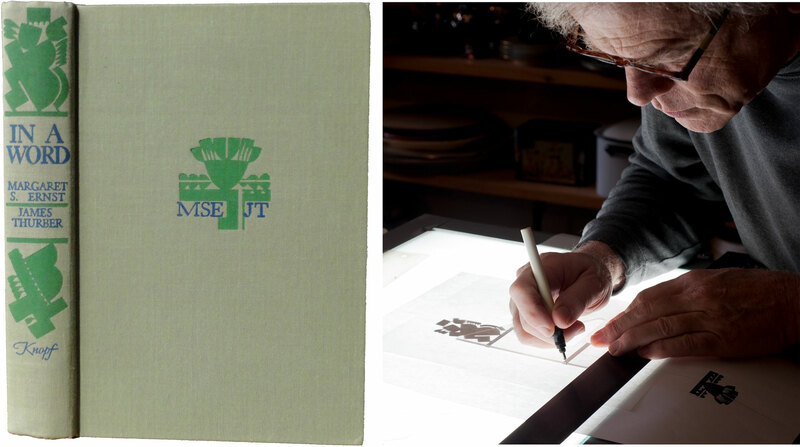 Right: The design reinterpreted for A Life in Design , rendered in ink on matte-surface mylar by author Bruce Kennett. Dwiggins was known for his modular ornamentation. Did you emulate that here with your own ornaments, or did you find some of his that worked? RL: Bruce offered the opportunity to let me design the ornaments for the spine. After some thought, I decided that Dwiggins was the master here and my lettering would be more than happy to stand next to his designs. Lettering Arts Guild of Boston, ca. 1978. Speaking of Mr. Lipton, the expert scriptmaker is visiting Letterform Archive in November to teach a Type@Cooper West workshop. Keep updated on events like these: join our mailing list.